Greece Holidays around Heraklion. A buzzing seaside city bridging the gap between yesterday and today, the capital of Crete has a plethora of holiday experiences to offer. Heraklion is a multifaceted seaside city and a major urban centre. Come and discover the many world-renowned attractions it has to offer. The Heraklion of yesterday: the Venetian harbour and walls, ideal for a nostalgic walk through history. And the vibrant city of today: city squares and pedestrian walkways filled with a youthful energy, raki (the local drink), ouzo, gourmet restaurants and luxury hotels. Along with these, a number of excellent museums and one of the largest aquariums in Europe. Just beyond the city limits, explore the vaunted Knossos, one of the most significant sights on the island and in Greece: the most important centre of the Minoan civilisation, the palace of King Minos and the home of the myth of the Minotaur. 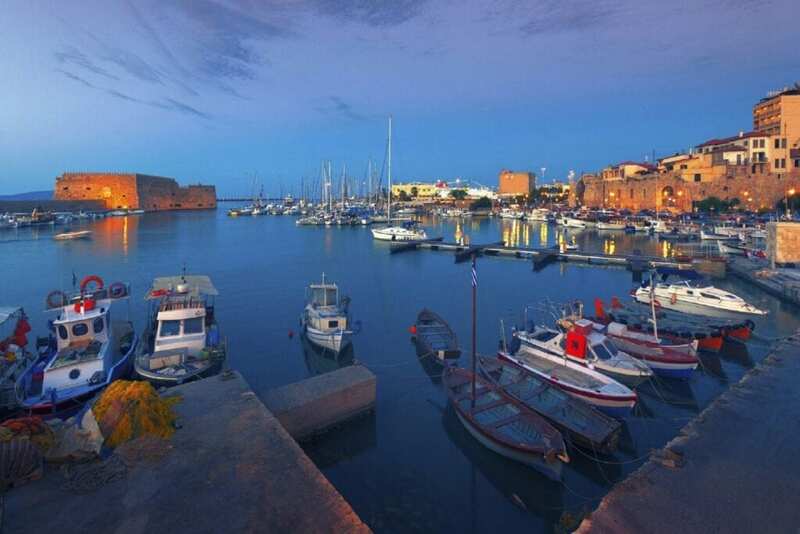 The historic Candia, the city of Heraklion with its Venetian port is a modern capital with dozens of options in culture, accommodation, dining and entertainment. It is a city where you can enjoy the pleasures of today and the beauty of yesterday. Walk and enjoy the sights, like the impressive church of Agios Titos in the square, originally built by Byzantine emperor Nikephorus Phocas in 961. Admire the Armeria (armory) next to St Titus, and The Loggia (City Hall) with its 82 metopes and beautiful arcades. Directly across it you’ll find the lively Morosini (Leondaria) square with its lions’ head fountain. Moving on to Eleftherias Square is an impressive building housing the Prefecture of Heraklion and the Law Courts. At the entrance of Heraklion’s Venetian harbour, the Koules Fortress (also known as Castello Del Molo or Rocca al Mare) gazes proudly out to sea. It was built by the Venetians and took its final form between the years of 1523-1540. It has been repaired several times and during Ottoman rule it served as a prison. Across the harbour the Venetian shipyards make for a romantic backdrop. Walking along the walls, you will see how beautiful this city looks from this vantage point. You’ll pause in small shady parks and admire the genius of the famous Venetian architect, Michele Sanmicheli, who designed the walls and bastions more than 400 years ago. The Venetian walls demarcating today’s old town, an impressive feat of engineering, made Heraklion the best-fortified city in the Mediterranean. The master craftsman Daedalus built the labyrinth for the mythical King Minos in order to isolate the Minotaur, a creature that was half man, half bull. Theseus, the son of the King of Athens, slew him and found his way out of the labyrinth with the help of Minos’ daughter, Ariadne. The most important centre of the Minoan civilisation and one of the most popular archaeological sites in Greece, it is just 5km from Heraklion. It was the headquarters of King Minos and its complex architecture that gave birth to the myth of the labyrinth. Thanks to Sir Arthur Evans’ restoration (the archaeologist who excavated Knossos) it is now one of the most fascinating sites in Greece, where you can experience exactly what life was like inside the palace. Admire the throne room, the heart of the palatial complex, which consists of the central court and the main chamber; the Processional Way decorated with frescoes, including the “Prince with the Lilies”; the Propylaea and the famous Bull’s Horns, one of the sacred symbols of Minoan religion. The royal apartments that consist of the hall of “Double Axes” and the “Apartments of the Queen” with its ‘’Dolphins’’ mural. The Palace of Knossos flourished during the Minoan period (2000-1350 BC) and was the most important socioeconomic and religious centre of Crete. This famous museum is considered one of the most important museums in Europe. The exhibits include representative samples from all periods of Cretan history, covering a span of 5,500 years. You will admire the frescoes of “the Bull Leaper”, the “Prince with the Lilies”, the “Monkey saffron collector”, the “Blue Ladies”, and especially “La Parisienne’’. The new wing of the museum opened in August 2013, with exhibits ranging from the Geometric, Archaic and Classical periods as well as the Roman era. Sharks, seahorses, jellyfish: you’ll be astonished by the Mediterranean marine world parading before your very eyes. Cretaquarium, which includes 60 tanks with 1.7 million litres of seawater, is one of the largest aquariums in Europe. The aquarium is home to more than 4,000 organisms. Crete knows how to surprise and amaze you! Enjoy dishes from the celebrated Cretan cuisine at one of the city’s many cafes, tavernas and restaurants, accompanied by traditional music, fine wines and tsikoudia (Crete’s famous firewater). Then move on to designer cafes, trendy bars, hip hangouts and pulsating dance clubs that stay open till dawn. The dining and entertainment options in Heraklion are infinite. Choose from the modern city hotels and boutique hotels in the centre’s historic buildings, surrounded by exceptional restaurants and bars with spectacular views to the Venetian port. Large, modern resorts may also be found at the city’s nearby beaches. Take your pick: Ammoudara, a big beautiful beach just west of the city, completely organised with dozens of resorts. Tobruk, in the east, has lots of restaurants, hotels, and cafes. The Arena or Red Hani, a beach enjoyed by a young crowd, features hotels, shops, restaurants and beach bars playing music. Under the auspices of the University of Crete, it consists of five departments – Zoological, Botanical, Anthropological, Geological-Paleontological and Mineralogical. The collections include samples from Greece and the Mediterranean in general. This impressive modern museum is housed in an elegant, 20th-century building. It has a diverse number of permanent exhibitions, including the Byzantine and Post-Byzantine Collection, the Numismatic Collection, the Ceramics and Sculpture section, the Nikos Kazantzakis rooms and the Ethnographic Collection. The pedestrian Daedalus shopping street, full of designer stores, connects Lionadarakia and Eleftherias squares. Walking west from the lion fountain, you enter the wide pedestrian Handakos Street, saturated with more shops and cafes.